Our Mission is Growing Disciples of Jesus Christ by Serving Christ in the World. Read more below and follow the links to learn more about our Service ministries and how you can get involved. ​For more information contact Tom Martin at ttmartinhome@gmail.com. ​Jesus used 5 loaves and 2 fish to serve the multitude. The 5&2 Hunger Ministry Serves Christ in the World by helping to alleviate hunger in Cobb County by supporting local families with their food needs. We collect food donations for MUST Ministries and the Church of the Holy Comforter, and we sell grocery store cards, using the small margin to financially support Cobb County Meals on Wheels and the Center for Family Resources. We Serve Christ in the World by encouraging at-risk girls of Atlanta to break the cycle of poverty for a better life through the Cool Girls organization. We provide a back-to-school event each summer to provide supplies, clothes, fun and friendship for the girls of Cool Girls. We serve Christ in the World by providing transitional shelter and support for homeless families in Cobb County through the Family Promise organization. Family Promise coordinates a network of churches that rotate to provide shelter for a week at a time. For four separate weeks during the year, we house families in our church overnight, while Family Promise provides them with job training, school stability for the kids, and help to get back into settled housing. We Serve Christ in the World by supporting the Church of the Holy Comforter. 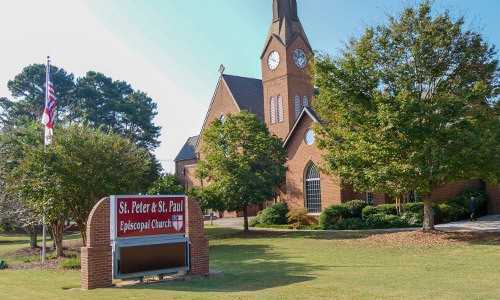 Holy Comforter is a parish whose members are mostly developmentally and mentally disabled. We support Holy Comforter with donations to their clothes closet, a once-a-month worship service, dinner, and fellowship, and an annual Christmas Party. For more information, Click Here and contact Rudy Lind at rudylind123@gmail.com. We Serve Christ in the World through the LAMB Institute, a Christian ministry in Tegucigalpa, Honduras. LAMB operates Flor del Campo, a school and day care center and a community food distribution center. The school serves approximately 160 students in grades pre-K through 6th. LAMB also serves the needs of a community in the mountains outside Tegucigalpa. St. Peter & St. Paul sends missionaries to help with construction projects and assistance at the school and community. We Serve Christ in the World through a consignment sale of kid’s toys clothing and supplies. These sales, one in August and one in January, help provide good quality items at low cost for our neighborhood. Surplus materials go to various charities in the Atlanta area. For more information, Click Here and contact E.V. Bennett at eloisevwall@gmail.com. We Serve Christ in the World by providing Mothers Of PreSchoolers with support, networking, and opportunities for spiritual growth and service. MOPS is part of MOPS International. You do not need to be a member of St. Peter & St. Paul to participate. MOPS meets once a month, and in other activities as planned. For more information, Click Here and contact Joanne McRae at joanne.r.mcrae@gmail.com. We Serve Christ in the World by reaching out to the needy in Cobb County through MUST Ministries. MUST offers a wide range of services to help people break the cycle of poverty: emergency shelter, transitional housing, meals, groceries, clothing, job readiness and placement, substance abuse counseling, financial assistance, children’s programs, community support groups, access to free health care, access to affordable housing. 4th Thursday and the 5th Thursday morning breakfasts throughout the year at MUST Elizabeth House. For more information, Click Here and contact Tom Martin at ttmartinhome@gmail.com. We Serve Christ in the World though helping addicts find serenity and sobriety through Alcoholics Anonymous. We Serve Christ in the World though helping addicts find serenity and sobriety through Narcotics Anonymous. NA meets on Thursday evenings at 7 PM in the Choir Room. This is a mobile food pantry program. St. Peter & St. Paul provides free groceries on the first Tuesday of each month from 10am to 1pm. It serves those in need of food and spiritual nourishment. Volunteers are needed in many areas. Contact Linda Koehler at 770.363.4564 or Rachel Buhler at rachelbuhler@gmail.com for more information. Each Friday, we gather to cook breakfast for the men of the Extension’s men’s house. The Extension is a residential addiction recovery for those at the bottom of their addiction. They make a real difference in the lives of these people, and we bring good food, fellowship and heartfelt prayer to men seeking recovery and a new life. For more information, contact Tom Martin at ttmartinhome@gmail.com.